Work I do for the love, not the money. Supporting the huge growing community movement fighting for a better world by harnessing the skills and resources of professionals, techs, creatives and communicators. Now under the actionskills brand, i have been supporting groups with hosting and related services. Produced training resources and delivery of training to grassroots groups on using encryption communication and collaboration technologies. Collaboration based on Scott Ludlams work. 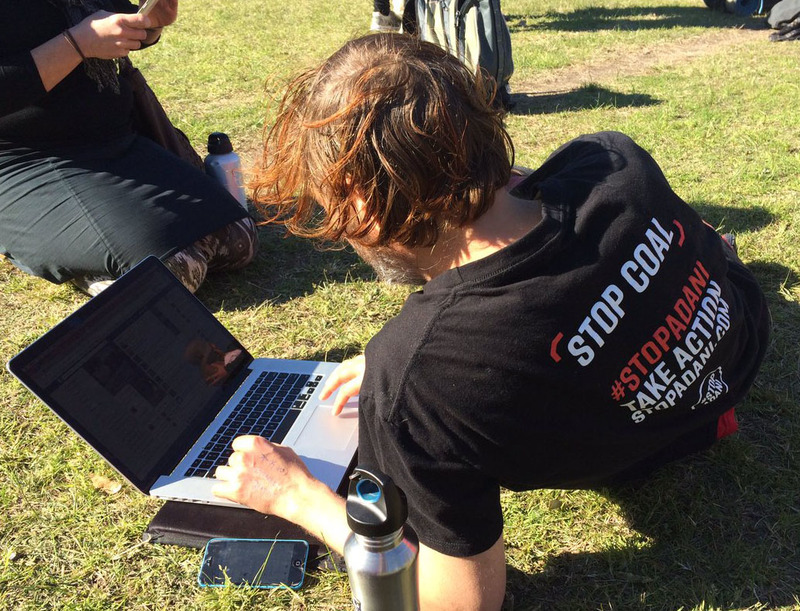 Designed and implemented the tech stack and people systems to allow people to participate in, and support the Stop Adani blockade camp remotely. This included encrypted communication and collaboration systems as well as volunteer management. An evolution of active creatives where we focus on collaborative production, skill share and capacity building. Active Creatives is sort of a workshop where we work on each others projects together. As part of the State of Design Festival, Climate ReDesign tries an experimental collaborative project to generate ideas for action on climate change. Information and resources for designers wanting to become more socially and environmentally ethical with their work. Workshops to create resources for NGOs and encourage creatives to volunteer their skills. Contributing member of the following Information Technology working groups. A national gathering of peace makers and anti war activists, themed on closing the U.S. spy and drone base at Pine Gap. Ccoordinator of media collective, website and social media. A solutions based climate change campaign group. Showcasing ground-breaking features, shorts and documentaries about the transition to a better world. An Australian Political hip-hop group from Melbourne who practice what they preach. The Accountability Round Table is dedicated to improving standards of accountability, probity, transparency and democratic practice in all governments and parliaments in Australia. A platform to inform, educate and activate the Australian and International community about the effects of the nuclear industry with strong support from leading Australian musicians. Stop APDSEX, 2009, Australian and Pacific Defence and Security Exhibition. Palm Sunday Peace Festival, 2007, Anti-nuclear parade and concert held at Sidney Myer Music Bowl. Zero Emissions Network, 2007, Campaign aimed at Australian NGOs to campaign for a zero emissions target for greenhouse gases, based on science rather than politics. My Favourite Travel Photo, 2006, Art auction raising money to build schools in Bangladesh. Melbourne Indymedia, 2005, User generated news and media portal. Nuclear Free Australia, 2003 – 2004, Coalition of various Australian anti-nuclear groups. Close Pine Gap Campaign, 2003, Pine Gap is located near Alice Springs and is the American military’s second most important communications base. Atomic Oz Roadshow, 2002, Travelling theatre educating on nuclear issues. Headquarters, 1999, Youth centre, venue and skateboard park.